Understanding the world of finance can be difficult for just about anyone in this country, but especially so when the rules of the industry are written in a language that you might not be proficient in. For these consumers, the Consumer Financial Protection Bureau has created a new set of guides aimed at helping them avoid financial devastation. According to the CFPB, individuals with limited English proficiency may be more likely to fall prey to frauds and schemes – such as the “Notario” scam – and often face more difficulty in managing their finances on a day-to-day basis. For this reason, the Bureau developed the Newcomer’s Guides to Managing Money, providing recent immigrants with straightforward information about basic money decisions. The new guides feature short tips to help people new to the U.S. banking system understand the difference between legitimate financial services and products and those that are only out to pilfer their hard-earned funds. The Newcomer’s Guides to Managing Money covers four topics: checklists for opening an account [PDF], ways to pay your bills [PDF], ways to receive your money [PDF], and selecting financial products and services [PDF]. Each guide contains information on how individuals can submit a complaint if they run into issue with fraudulent products or services. 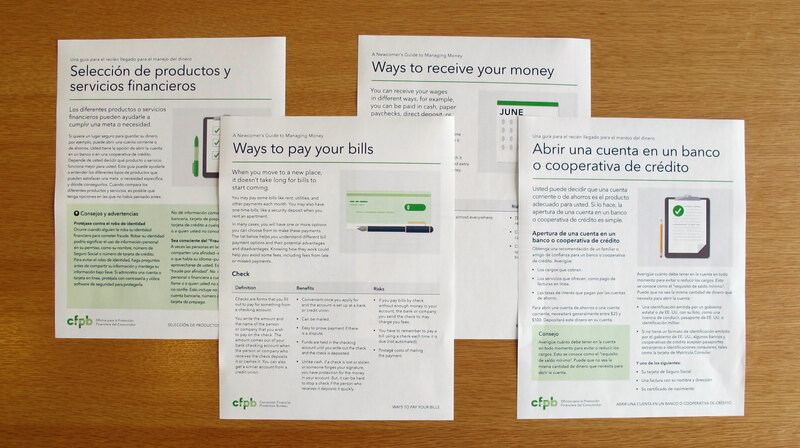 For now, the guides come in English and Spanish, but the CFPB anticipates adding additional languages in coming months. “These guides are part of our commitment to provide people who may be new to the U.S. banking system, including people with limited English proficiency, the information they need to make the best financial decisions for themselves and their families,” the CFPB states.